Mpumalanga, meaning 'land of the rising sun', is a province rich in wildlife, culture, pioneer history, and natural beauty. Situated in the east of the country, north of KwaZulu-Natal, it borders Swaziland and Mozambique and encompasses the southern section of the world-renowned Kruger National Park. Mpumalanga is 'Big Game Country', and the Lowveld is the setting for dozens of private game reserves and luxury lodges that abound in bird and animal life. Nelspruit is the capital and gateway to the province, situated two hundred miles (325km) east of Johannesburg, and is South Africa's fastest growing city with a vibrant CBD. Although not much of a tourist attraction in itself, Nelspruit is situated in the heart of a region rich in natural attractions, which makes it a favourite jumping off point for exploring the Lowveld area. The city's train station and airport welcome travellers several times a day, most of whom are en route to the Kruger National Park, whose southern Malelane Gate is about 40 miles (63km) from Nelspruit. It is not only those interested in safaris that come to Mpumalanga, however. Besides wonderful opportunities for bird watching and game viewing, the area is also scenically beautiful, with its mountains, valleys, waterfalls, canyons, and panoramic passes spread across the region. 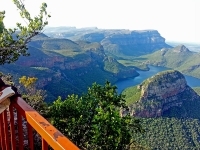 Mpumalanga's lack of development means more space for its natural finery, which is particularly evident along the scenic meander known as the Panorama Route that takes in spectacular sights along the eastern slopes of the escarpment. We are looking for contributors for our Mpumalanga travel guide. If you are a local, a regular traveller to Mpumalanga or a travel professional with time to contribute and answer occasional forum questions, please contact us.